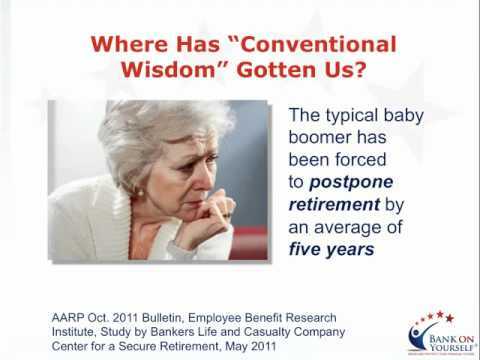 This short video reveals the problems with the conventional wisdom about financial and retirement planning, and explains why the average family with a head of household age 60-70 has been able to save only 25% of what it will need for retirement. 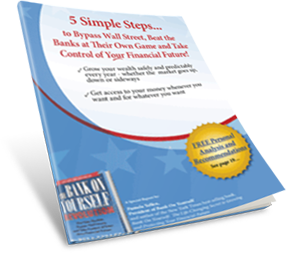 Many readers of this blog have asked to see more specific examples showing how much guaranteed and predictable income you could have in retirement, using the Bank On Yourself method. So I’ve included a fascinating example on this video. If you have the feeling your financial plan has been treading water (or going backwards) for far too long, you’ll want to be sure to watch this video now. It’s got some pretty cool animation in it, too! Wondering where you’ll find the funds to start a plan? Don’t worry! You’ll receive a referral to one of only 200 advisors in the country who have met the rigorous requirements to be a Bank On Yourself Authorized Advisor and can show you eight ways to find money to fund a plan that can help you reach as many of your goals as possible, in the shortest time possible. I’ve been studying this concept for about 3 months and it just gets better and better. 1. I would include what convinced me and my wife and give it a little coverage. A chart would be helpful. you end up with $353,804 at the end. If you pay cash for about a $3,000 purchase and start over saving up for another $3,000 purchase and start over… Do this only 4 times and you lose your compounding for that period and after 30 years you lose $241,911 and save only $107,893. Paying cash for a purchase used to mean you were financially fiscal and frugal, the best you could do. But, what a loser that has proven to be. That begs the question… How can you make a purchase and not lose the compounding? I don’t call it a whole life policy because most people, including myself, are only familiar with the type that does not allow you to do this. Structuring a policy to do this includes different features that my whole life policy didn’t include. Where is there a conventional whole life policy that let’s me effectively save for my retirement? It’s much more than a whole life policy. If you can borrow from your whole life policy, does your cash value keep earning dividends on the amount you borrowed and doesn’t stop compounding? Can you set the length of the loan at the term you want it to be so that it fits your budget? Does your insurance agent set up a plan that will pay off your policy in 6 years, based on your ability to pay the premiums? That means you can stop paying premiums in that time and your contributions after that will build your cash value. This doesn’t happen in a conventional whole life policy. This method of savings is based on your cash flow…money you can put toward the premiums every month. My advisor suggested refinancing our house because we are in debt and couldn’t afford to get started. Refinancing the house has gained us $1,327 each month and reduced our monthly bills on loans from $1,700 to $373 a month. This approach of helping you see if you can afford this every month can open up ways to cut down expenses that you may not have considered. You add on top of that how much money this enables you to grow and the purchases you didn’t think possible and you have a win, win, win… etc . situation. I didn’t underestimate the power of compounding, I just didn’t know there was a financial instrument that allowed us to do it in a predictable fashion. 2. I would not call Dave and Suze financial entertainers. It sounds a little cocky, given that they have helped a lot of people, including my son and his wife. You were more respectful in the book. Thanks to Dave, my boy and his wife have no debts and pay cash for everything, including his new fully loaded $29,000 GMC Terrain SUV. They’ll have their house paid off in a few years and their only 29. What they don’t know is that this financial instrument would have saved them 29 thousand dollars, after they pay themselves back and their $29,000 would have kept compounding with dividends… all without having to pay taxes on the earnings in the policy. Dave has helped them but they can go to the next level and do much, much better, like leaving their kids millions instead of thousands. 3. It would help to include a plug for the book in the video. It really got my research “turbo charged” and explained some of the technical aspects of this method that made it clearer, which you don’t have time to do in the video. It would also help to explain in the book that the insurance company does charge a % for the loans they make, it just gets offset by your money compounding with the dividends and by paying off the loan early. There was a little reference to this in the book, which I didn’t understand, and when I found out about it, I thought I found a big problem but later discovered that I come out ahead in the end. Thanks for the video and the opportunity to comment on it. Keep lighting the way. I am looking forward to sending it to my kids. Thanks for the excellent insights and suggestions. Glad you’ve embraced this concept and are understanding it better every day. And, yes, I know that Dave Ramsey and Suze Orman have helped many people and I acknowledge that in my book and on my website. At the same time, their unrelenting crusade against all whole life insurance has done substantial damage to those who are searching for true financial security. I don’t blame you. I just don’ want some of his loyalists,Ike my son and his wife, to dismiss this awesome opportunity because their poor little Dave got his head thumped.. which he deserves. I’ll do my best to spread the word and even promote a program of yours, if you have one. Thanks for the response, I am honored. Just curious, what type of mortgage did you have? What rate and how large was the balance? The idea sounds great just needs a little more elaboration. Wow, Phillip Edwards response is the better than the video. The second you lambast other methods, you lose credibility in my book. We are all at different levels of skill, knowledge, and Suze O and others perform a valuable service for a certain type of person and I laud their efforts to help those to help themselves. I don’t like fear based maketing, and I don’t consider myself an average investor. I would view this concept as a part of my overall investment/retirement plan–along with my real estate, portfolio, and business income generators. It just seems incongruent that the vidoe starts out so general about the ‘other’ investment strategies being lame (which in my portfolio & RE I’ve had respectable gains in the last 12 years) when insurance can be dicey as well. I understand that your rider generators are what make you unique–but then there are other unique ways of investing in any field that make it a viable option for some. I would appreciate a comparison on how you stack up against other insurance products/providers like Met Life who provide the same insurance riders–apples to apples. I would have like more information on how the policies are maintained, and how my insurance agent gets paid. what the costs are for maintaining and failing to maintain these contracts are. What the tax advantages are–better for after tax or before tax dollars. That would give me a more effective model for consideration than the video shown . Thanks for letting me put in my 2 cents worth.